Cod is well suited for modern man’s consumption. The lean flesh is rich in proteins and has a low fat content. In the old times it was praised because it can easily be preserved as dried or salted. 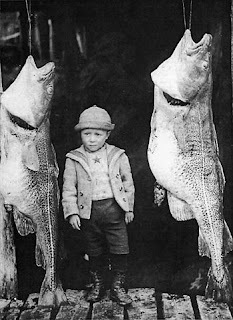 Cod was probably a favorite dish ever since people inhabited northern Europe and learned to fish. Cod remains have been found among other food trash in a stone-age settlement on Gotland Island in the Baltic. The settlement was dated to 3000 years BC. It’s no wonder then that Atlantic Cod, specifically those cod populations from North American waters have been drastically overfished and it’s estimated we are now consuming the last 10% of this cod population. Some Canadian cod stocks are so low as to be listed as endangered or threatened. Strict measured have been implemented on both sides of the Atlantic to curtail the decline of the cod populations, but some experts speculate it’s too little too late. Pacific Cod on the other had is a healthy sustainable fishery. Hook-and line, or trap caught Pacific cod from the U.S. Bering Sea and Aleutian Island areas are considered the consumers most responsible choice. Man cannot live of cod alone I say. While Lake Whitefish might be a favorite snack of those residing in upper Michigan, it’s mostly a regional delicacy, if you will. Mackerel is a very powerfully flavored fish that doesn’t translate well to the current American’s palette. Both of these fish are perfect in certain instances, but lack broad appeal as the poll shows. Farmed Sturgeon on the other hand is my personal favorite. While it may be difficult to find at the neighborhood grocery store it is almost always available from my purveyors. The blight of Caspian Sturgeon and the near universal ban on Caspian Caviar makes most people cringe when they hear, “sturgeon.” Fortunately fish farms in California have done an exceptional job creating an eco-responsible product. For those who have not had sturgeon I greatly encourage you to as soon as possible. The flavor is mild yet satisfying. The texture is rather dense similar to swordfish, but less likely to dry out. I’ve likened a thick hunk of sturgeon to a veal chop. One of my favorite dishes all time is seared sturgeon over truffled black lentils, creamy leeks, and caramelized cippollini onions. I had a dish similar to this at Lola way back when it was in Tremont, and enjoyed it so much that I’ve resurrected it a few times as a special. I'm just curious, do you educate your customers as to what fish you serve and why? I'm guessing that your audience in Oberlin may be a little more up to speed on sustainable fish than the average Cleveland restaurant patron. My perception is that people don't necessarily NOT care, it's that a lot of them don't understand to what degree the problem exists. I think Doug Katz at Fire does a great job of at least putting the Monterrey Bay information out there for people. It doesn't come off as preachy, but I think it certainly gives people pause for thought. We choose not to purchase fish on the MBA list because it has to start somewhere. Is it cheap? No, but I think, like architecture, constraints lead us to new innovations. I did notice that Doug is on the short list of non-local reastaurants on the Montery Bay Aquarium Seafood Watch list. I will say that being so far from each coast limits availabilty, if you keep cost with in reason. But we have every intention to keep as close as possible to the MBA list. This was mentioned in our first press with the Oberlin newspaper. We don't mention the farms or guidlines we implement on our dinner menu. Our lunch menu has a list of local farms. I think people have come to expect such standards from the Black River Cafe, and it only takes an occasional nudge to remind everyone. It is somehting i take to heart, and luckily I found a restauranture in Joe who has simlilar ideas. Hey Michael -- is "whitefish" at all similar to New Zealand "whitebait?" What to do? Many wild species are over fished yet people have been taught that farm raised is bad. Salty, What i've come to learn while reading up on responsible fish purchasing is that there is a good way and a bad way to fish for or farm almost any species. For example specific populations are different like the Atlantic and Pacific cod, or the fishing method is different like line-caught, or Pot caught cod are more responsible than trawling. In the past I've never thought to order the Pacific line caught cod, I just said, "gimme 10 pounds of the least expensive cod you have." People need to be re-educated about fish farming because, like you say the average guy has the impression that all farmed fish is bad because giant commercial salmon farms have pushed the evelope and crossed the line from good to bad. Oh dear Rachel, Lake Whitefish are nothing like the slimy, transucent larvea refered to as New Zealand Whitebait. Whitefish populations plummeted in the 70's and 80's due to overfishing and pollution of the Great Lakes. The re-population of their stocks is a great success story in both evironmental cleansing and fishing management. In the upper peninsula of Michigan Whitefish is unbelievably popular. It's sold smoked at gas stations next to the beef jerky! Along with any other possible cooking method you could think of. The fish is as you could imagine white! flakey, and mild lacking many other distiguishing characteristics, very much unlike Whitebait. Wow -- you make Whitebait sound horrible. I found it SUPER yummy! Mmmmm...I am dreaming right now of a hot Whitebait sandwich with fresh herbs. Yum! I'll have to try this Whitefish next time I go visit my parents in their brand new locale in Traverse City. Sorry to downtalk NZ whitebait, but the research I did revealed somehthing of a regional delicasy to say the least. So you folks live in Traverse City now? I thought that was the Cherry, or maybe Blueberry capital of the midwest? I'm sure you can find some smoked whitefish there. If you get a chance to visit Mackena island, wow, they eat whitefish morning, day and night. I have a place in Door County Wisconsin. It's that large penninsula in Wisconsin that sticks out into Lake Michigan. Whitefish is HUGE! The local delicacy is what's called a "fish boil", most popular restaurants feature a fish boil during tourist season. It's always outdoors and over an open fire. Google Door County fish boil sometime. It's a relative of trout and salmon, high oil content.